Alhamdulilllaah, there are some outstanding opportunities for views of the downtown Kuala Lumpur skyline from the roof of our apartment here. Some of the shots are clearer than others due to the conditions at the time I took theme. These are my first attempts, as well, so keep that in mind. Click the link to see them! Just yesterday I purchased a tripod specifically so I can take more steady shots. It will also help me in taking more clear & even panoramas, because with a tripod I can have a more even axis of rotation – as opposed to the rotation happening due to me twisting my waist with the camera held in front of my face. I think this will yield even better & more accurate panoramas, in shaaʾ Allaah. Look to a future post where I explain how I created these images. It’s amazingly more simple than it seems, alhamdulillaah. OK, these are pretty amazing. I love how you are not satisfied with the “point-and-shoot” aspect of your point-and-shoot camera. *smile* Actually, I think I like these images better than some of your motion videos; at least as far as image composition. I’m excited to see what you are able to capture with your new tripod. waa………… malaysiaku. 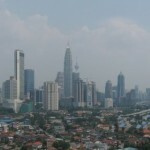 rindu gila kat kuala lumpur :). Takpe2 taun depan balik INSYAALLAH. Nick: Wa ʿalaykumussalaam (the response to “Assalaamu ʿalaykum” – don’t mind the transliteration, there are many different ways). I’m glad you liked them. The panorama’s are definitely nice, and I haven’t had a chance to make too many more. I agree with these being better than the time-lapse videos. We can thank Hugin for that. Masha’allah, Beautiful… U gotta teach me how to do that! ahh mashaallah…malaysia…bittersweet for me right now…miss it, but not enough to compel me to return indefinitely. 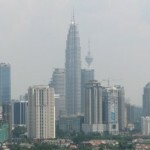 I think I only recognize Menara KL in the pics..
I’d be happy to. It’s really easy, actually. I use all free-and-open-source software, so there is nothing you have to buy (except for a computer if you don’t already have one). I take several photos of a wide-angle scene, either rotating at my waist or using a tripod (better), and then I load these pictures into the application named “Hugin” – http://hugin.sourceforge.net/ – which, when combined with the tools autopano & enblend, will merge & blend the myriad images into one wide-angle shot, and you get results as good or better than I have above. I no longer use Windows, so I am not sure how easy it is to get Hugin working there (I use Fedora GNU/Linux), but it’s possible, from what I understand. If you have trouble, let me know and I’d be more than happy to help! 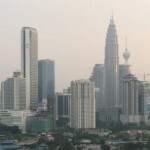 Was KLCC/Petronas towers still unfinished when you left? It’s a little odd because from the angle of the pictures above, only one of the two towers is visible. I guess it has been a long time since you’ve been here last. I intend on taking some more pictures, in shaaʾ Allaah once we travel to more scenic areas. I have a few places in mind, but it’s hard to just up-and-move sometimes.